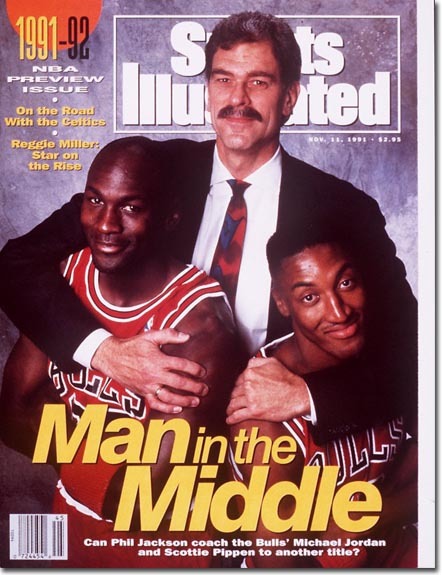 And A Player To Be Named Later: Is Phil Jackson the Best NBA Coach Ever? More knowledgeable people than I could better answer this question. But honestly, my gut instinct is no. When you have the best player in the history of the world on your team, it's easy to coach. Late in the game, down by one, all you have to say in the time out is "Give the ball to Michael." When Michael wasn't there, did Jackson win any championships? Then all he does is go to a team with Shaquille O'Neal and Kobe Bryant. "Give the ball to Shaq." Or, "Kobe, take over." Not much coaching needs to be done there. No, I'd like to see Jackson go to Milwaukee, or Memphis, or Jersey. Some place like that, where the best player or two in the game aren't in Phil's starting five. Jackson was a very good coach, no doubt. But the best ever. i don't think so. best at winning championships, yes. Best at leaving his great players to play, yes. Best at the Frankenstein posture, no, 2nd best behind Kevin McHale. The top two currently in all-time wins should not ever be mentioned as great coaches : Don Nelson and Lenny Wilkens.